I hope you’re still paying attention because these Rules, by novelist India Edghill, originally published in the Historical Novel Society’s magazine Solander, are absolutely indispensable if you want to get ahead as a feminist historical novelist. 1. All heroines are goddess-worshippers. If necessary (i.e., they are the daughter of the Jewish High Priest of Solomon’s Temple in Jerusalem), they are secret goddess-worshippers. 2. To be Politically Correct and not Offend Anyone, all gods are one god and all goddesses are one goddess. This means you don’t need to research their actual names or attributes, which is a real time-saver. Just remember that the deity the heroine worships is called simply “The Goddess”. To remain PC, from time to time try to remember that The Goddess has a Consort, The God (a deity who bears about the same vital relationship to The Goddess as Ken does to Barbie). 2a. In pre-Christianity historical novels, the goddess is properly called “the Great Mother”, even when the goddess actually worshipped has a perfectly good name, such as Isis, Asherah, or Inanna. 2b. In post-Christianity historical novels, Jesus is properly referred to as “the White Christ”, not to be confused with either the Lone Ranger or the Man from Glad. He may, however, be confused with the Goddess’s Consort. 2b.1. In which case, the Virgin Mary may, if you like, be confused with the Great Mother. 3. All goddess worshippers are pacifistic, politically-correct, and ecologically sound. 3a. All cultures that worship goddesses treat women well. All monotheistic cultures treat women badly. This holds true even though it requires ignoring such facts as sati in India (which has lots of goddesses) and female infanticide in pre-Islamic Arabia (which had lots of goddesses). 3b. All monotheistic cultures deny women any rights. This holds true even though it’s the Holy Qu’ran that grants women a half share in their father’s inheritance, rather than the zero share they got under the pan-Arabic pantheism that preceded Islam. 4a. Although they are pantheists, the Ancient Achaeans are Bad because they worship a Sky Father and drive out the Earth Mother. 4b. Although they are pantheists, Vikings are Bad because they worship an All-Father. 4b.l. Unless the book is a Viking romance, in which case I suppose the All-Father and the Great Mother can elope to Las Vegas for the weekend. 5. There are only two religions: The Old Religion and The New Religion. One of them is Good and one is Bad. Unfortunately, which is which varies according to time period. 5a. In Dark Ages fiction, Paganism is properly called The Old Religion, and is a Good Thing. It is opposed to Christianity, which is called the New Religion, and is a Bad Thing. 5a.2. But in novels about the English Civil War, the Cavaliers are Catholic and Good and the Roundheads are Protestant and Bad. 5b. In historical novels set in the 20th century, NeoPaganism is called the Old Religion, even though its name means “new Paganism” and you’d think it would be called the New Religion and Christianity would now be called the Old Religion. Well, it isn’t. 7 a. All those accused of being witches were women, because it’s all about male hatred of women, really. Again, ignore the trial records, if necessary (including all those defendants named named Henry, John, WaIter, and Philip). 8. Anyone accused of witchcraft actually is a follower of the Old Religion (whatever it is this book). They are never a devout Christian who is falsely accused. 9. All goddess-worshippers are expert herbalists and midwives. 10. All Christian priests are hypocritical bigots. 10a. Friars, however, may be sympathetic, if they’re not actually goddess-worshippers in disguise. 10b. Nuns may be unworldly nature-lovers or bitter bigots. Abbesses, however, are always narrow-minded. 10c. Abbesses are always sexually frustrated, cherishing an unholy passion for 1) the convent priest, or 2) the nubile new postulant, or 3) Jesus. 11. All goddess-worshippers enjoy their menstrual period as a time of womanly empowerment that proves their Oneness with Nature. No woman ever suffers cramps, migraines, nausea, bloating, or uncontrollable mood swings during her womanly “moon cycle”. 12. When the Bible is quoted to prove woman’s Subjugation to Man and her Inherent Vice, the quote will always be from the King James version, even though that translation dates from 1611 and your book is set in 1250. 12a. Whatever the book’s historical period, the patriarchal monotheistic villains will refer to Satan and the Devil, whether the concept’s been invented yet or not. 13a. All goddess-worshippers are violently tolerant of all varieties of sexual behavior. 13b. All Christians are violently intolerant of any variety of sexual behavior. 14. No man in a feministly-reimaged historical novel ever does anything worthwhile. 14a. All worthwhile achievements were really done by goddess-worshipping women. 14b. If the man is an historical figure who is well-documented as having definitely done something, the idea was really given to the great man by a goddess-worshipping woman. 14b.1. Unless he stole the idea from a GWW. 14b.2. Unless the accomplishment is a new weapon. All weapons are invented by men. 15. No heroine in a feministly-reimaged historical novel ever does anything bad, because women are inherently gentle and nurturing, dedicated to peace, harmony, the Great Chain of Being, Oneness, and the Circle of Life. 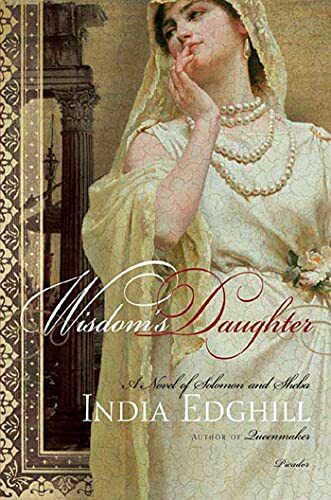 India Edghill’s novels include Wisdom’s Daughter: A Novel of Solomon and Sheba, and Queenmaker: A Novel of King David's Queen. Oh, yeah. I've read a good few of these. You can almost combine 5a and 5b. Often the "Old Religion" in Dark Age (and Celtic) novels resembles modern Neopaganism a bit too much. So I need a Celtic or Germanic priestess in my Roman trilogy? Fun. I can have them sacrify some prisoners. It's what happened after the Varus battle, after all. Or wait, feminist priestesses did no such thing, they would have tried to talk the Roman captives into following the cult of Nerthus. Who, I should not forget, can't be a dual goddess of both death and fertility as she most probably was, but of fertility only. How could I have missed that? Great fun.